Well. Not really a new FRONTIER, per se. More like just a new neighborhood. That is, if it all works out. 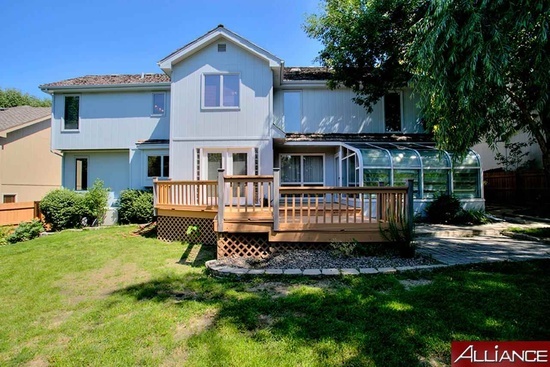 We've been casually looking for a new house for the last year or so, with the goal of moving into a better school district before Carys starts kindergarten. In the late fall, Chris spotted one that we both really liked. It's a very strange feeling - in viewing over two dozen homes (at least), it's the only one that jumped out to me as immediately feeling like home. And I'm honestly not sure EXACTLY why - the previous owners did some things I don't quite understand (like burrow into the foundation in the garage for extra storage even though there's a storage room in the house bigger than some apartments) and it's missing a couple of my "super duper wants" (like a 2nd floor laundry room and a walk-in pantry and a giant tile shower in the master bath) - but I LOVE it. 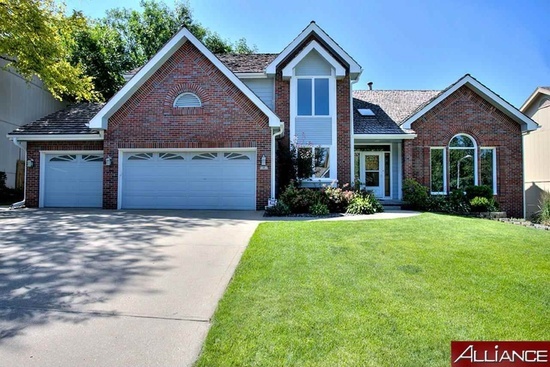 The location is exactly what we were looking for - at the edge of our preferred school district, so as close to my family as it can be while still being in the district. 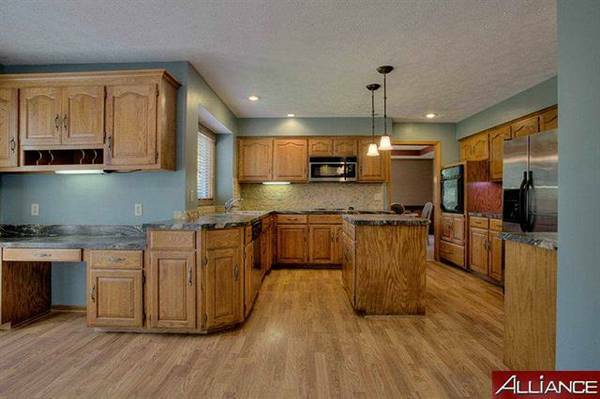 The kitchen is amazing (there are updates we'd love to do down the line to make it more modern and classic looking, and a little less country, but it's huge). And the bedrooms are all good sizes, and it has a room that's perfect for a playroom, and the master bathroom has a huge spa tub. And it has a sunroom! And tons and tons of storage. And five different types of flooring on the main floor alone (ok, that falls under "things I don't quite understand"). But I have visions, man. Visions of what it could be. And they're glorious. So. Here's the house - or a few bits and pieces of it, at least. These are mostly taken from the listing. 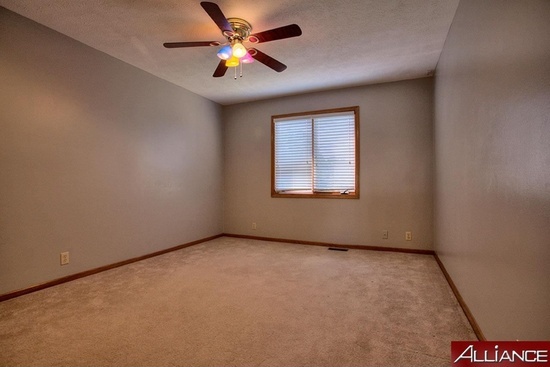 It's 4 bedrooms, 5 bathrooms (a 1/2 in the basement, a 1/2 on the mainfloor, a full in the master, a full guest bath, and a 3/4 in one of the bedrooms) and just about 3,000 square feet (WHAT ARE WE GOING TO DO WITH ALL THIS ROOM!?!?!?!) (PROBABLY FILL IT UP WITH MORE JUNK!). 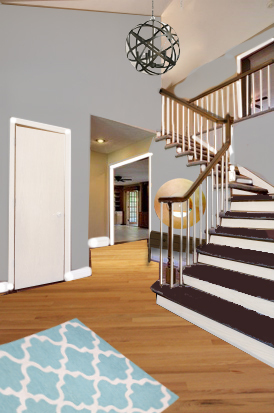 My to-do list includes painting all the trim white and giving the walls throughout most of the first floor a warm neutral gray color (maybe a greige? ), new floors throughout, and did I mention the paint? There will be lots of paint. I love the front of the house. It still seems cozy and inviting, despite the size being miles bigger than any house in which I've ever lived. This floor is like a fake wood tile. While it looks nice - and the previous owner DIYed the medallion in the entryway so I feel super guilty about this - it's going to go away at some point. 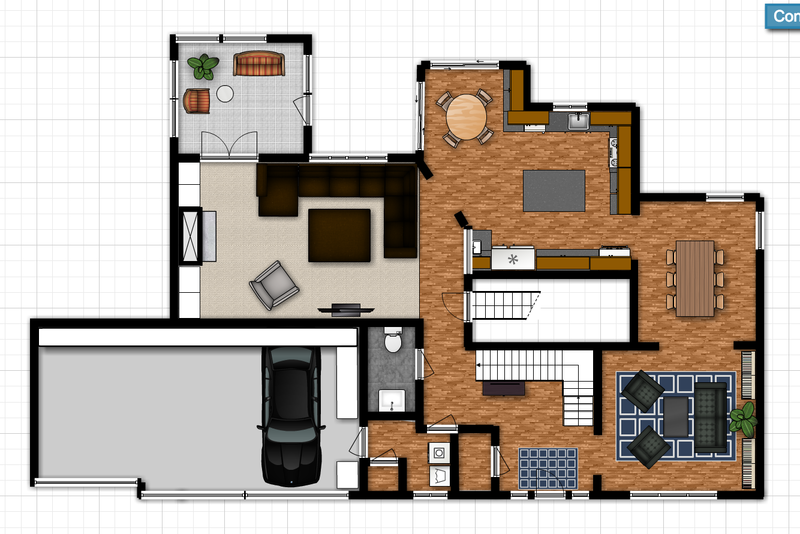 Eventually, I'd like to put the same flooring down everywhere on the first floor except for the family room (and possibly in there, too). I really want a new chandelier too. I even have it picked out. OF COURSE. Come on, World Market, surely you want to comp one to a blogger with five readers, right?? 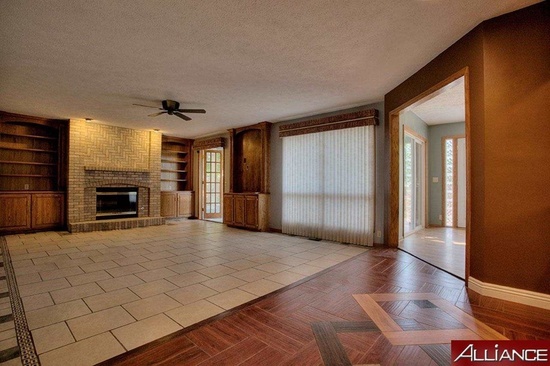 Here you can see three of the five different types of flooring in the first floor - tile in the family room, the wood tile, and wood in the kitchen back in the corner. And despite the fact that it has those fabric vertical blinds (which are going away), those are windows, not sliding glass doors there. 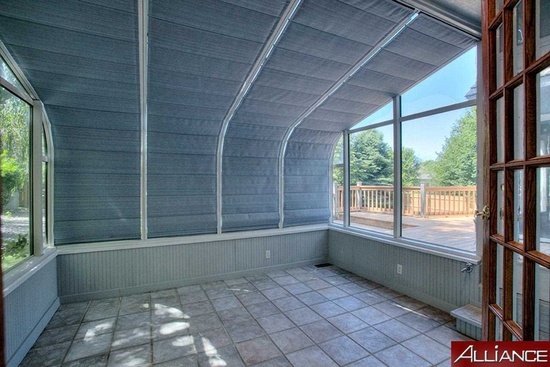 The French doors in the back go to the sunroom. The built in to the right will probably be pulled out if we can do so easily - our TV won't fit there. 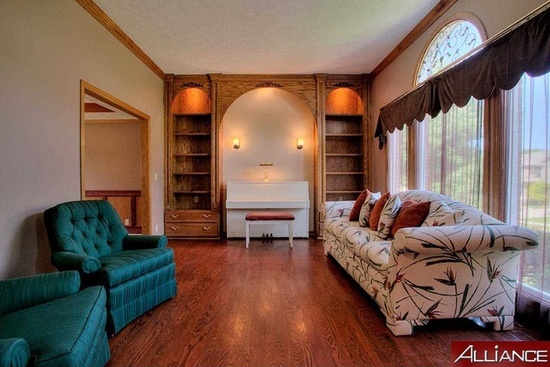 And I want to paint the other built-ins white and put a painted wood mantle over the brick mantle - like this or this. Just getting rid of those vertical blinds will make a world of difference in making the area brighter, and painting the built-ins will take it up 100%. It's hard to tell in the picture, but it's actually a step down to this room (with the step being where the two floors meet). It also needs more built-in lighting, I think. The sunroom. I LOVE THIS ROOM. Those blinds go all the way up so that it's all windows. So excited about this room! Also this picture just made me realize there are actually SIX types of flooring on the main level. No - make that seven including the guest bathroom. Eight including the garage concrete. Eight!!!!!!! The heart of the home - the kitchen. I'm going to replace those cottage-style hanging pendant lights with globes - I think it will make a huge difference in making it look a little more modern, like this. Eventually, way down the line, we might paint or replace the cabinets, but that'd mean redoing the backsplash and the counters, so since it's perfectly serviceable now, we're leaving it mostly as-is. 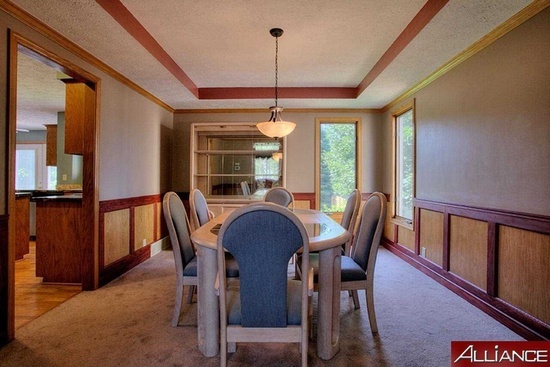 The biggest thing we want to do here is pull out the built-in desk on the right side and replace it with a pantry. The formal sitting room...we think? 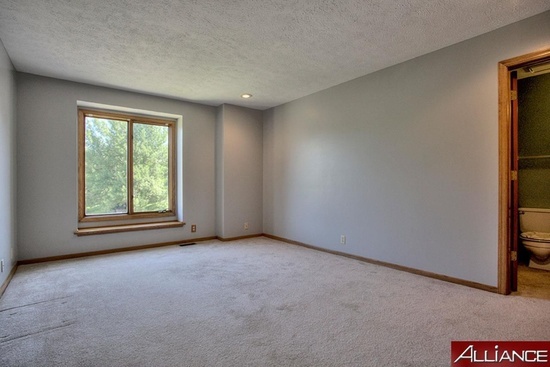 We're not completely sure what we'll do with this space. The built-ins will be painted, the metal scrollwork on the window removed, and the floor replaced to match the kitchen floor. 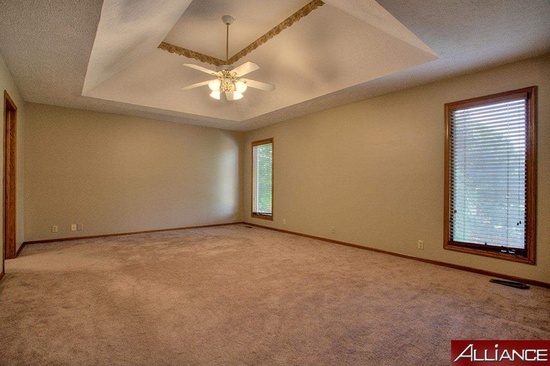 Despite how it looks, this room is almost square. 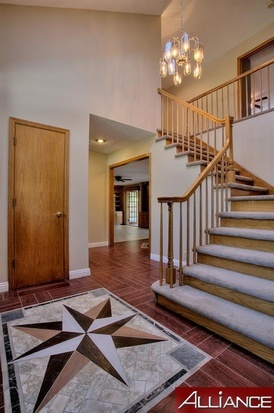 Damn those real estate photographers with their wide angle lenses! Lots of paint will be happening in this room. And a new pendant light, and new flooring. Moving upstairs to the bedrooms - here's the room that will be Carys's. She loves that window seat. And yes, your eyes do not deceive you - that's carpet in her bathroom. No, it's not staying. Carpet + toddler bathroom = grossness. I really want to paint the girls' new rooms to match their rooms at our current house - I love their rooms here. Master bedroom. Obviously paint and some wallpaper trim removal will be happening here. Eventually new carpet or floors and a new light. Trim painted white, etc, etc. 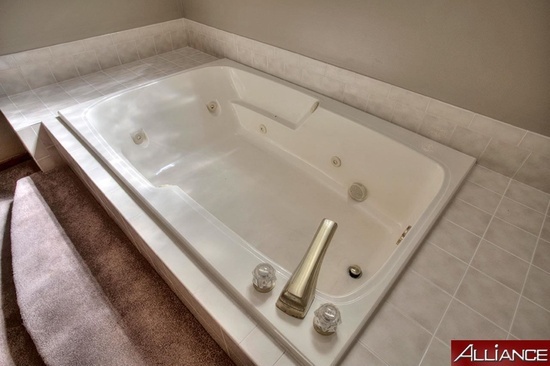 The tub in the master bathroom. And YES THAT IS MORE CARPET IN THE BATHROOM. I guess it's cushy and warm when you're brushing your teeth? But there's no around the toilet, so that's a plus. It must be a thing from either this builder or this era, because we looked at a bunch of houses with carpet in bathrooms. It is a Thing I Do Not Understand. What will be Emmeline's room. More paint. What will be the playroom. For now, we'll leave the wall color and green (??) carpet since it will probably get pretty dirty being played in all day every day. THE STORAGE ROOM AKA MY FAVORITE PART OF THE HOUSE. 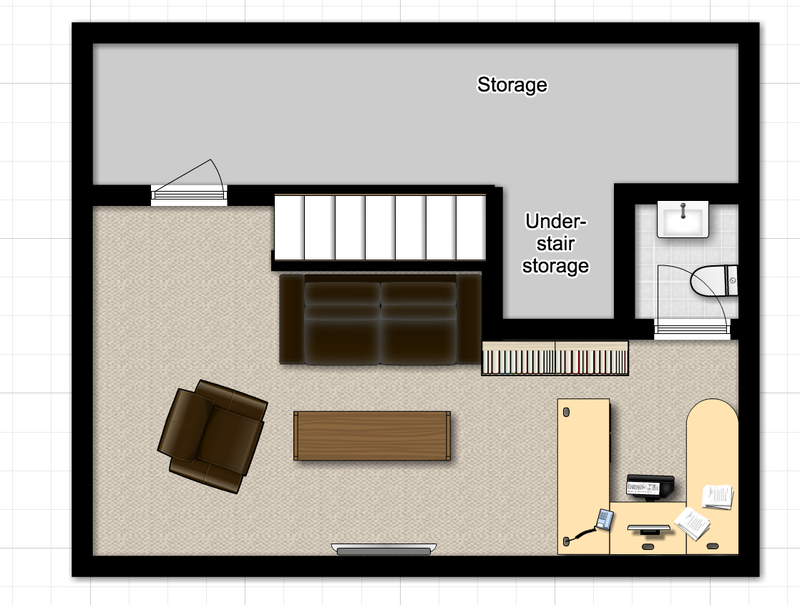 Ok, not favorite, but once this is lined with shelving and I can access things in storage without getting on my hands and knees and crawling under the stairs I will probably cry with joy. The backyard is actually slightly small, but really nice, and I think the size will be just fine. There's a park less than two blocks away and lots of trails, so we'll have plenty of room to run. There's some really nice landscaping back here, too. And now for some really bad photoshop renditions of what I'd like to do. 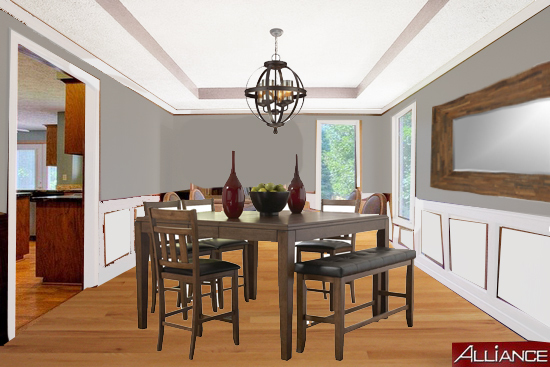 My plan for the dining room. 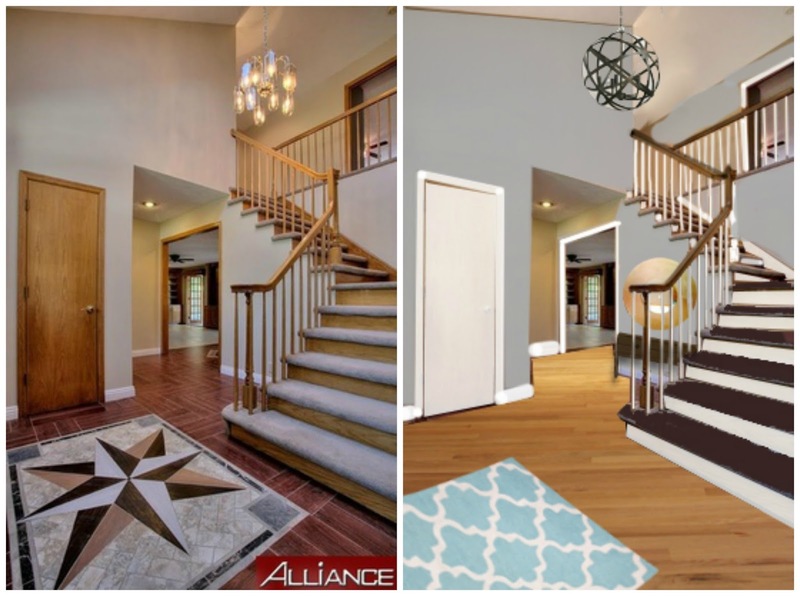 Warm gray walls, a new chandelier, and new floors. Oh, there will be curtains and probably some art. 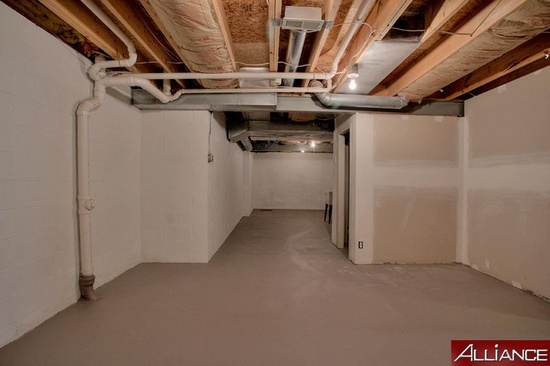 Basement with the glorious storage. This will just be Chris's office, with extra seating and a TV in case we ever need to send the kids down while the adults watch something on the main TV (when they're older). Next is the main floor layout with all those different types of floors shown. The entry door is at the bottom in front of the gray circle (representing the tile design). To the left of the door is the entryway closet, and around the corner are both the laundry room (which is also the entry to the house from the garage, and also has a small broom closet) and the guest bathroom. 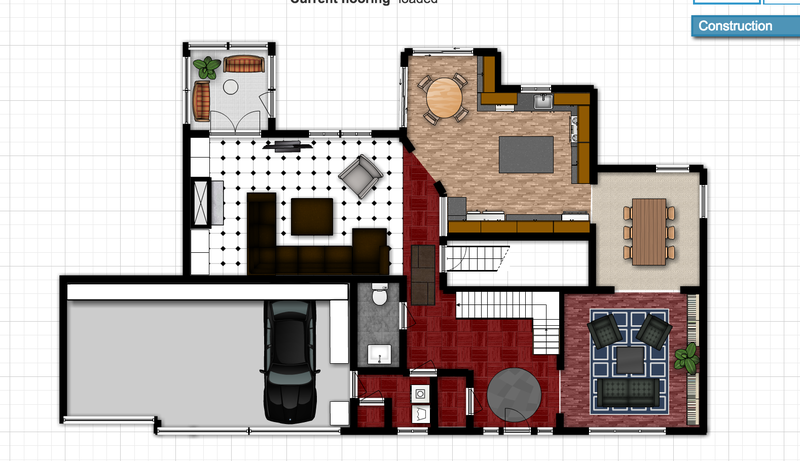 The family room is the white-tiled room, the sunroom off of the family room, the kitchen in the top middle, the dining room to the right, and then the formal sitting room in the lower right. They layout is really great, actually - it has great flow. I think, anyway. I don't really know anything about flow, but if I did, I feel like this would be a good flow. And, just for fun, here' the first floor after the flooring is updated. Doesn't it make such a huge difference?? 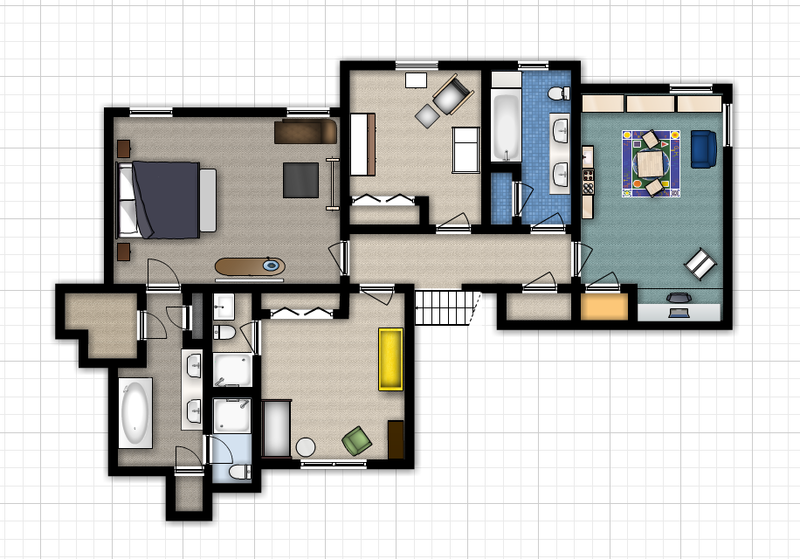 (A couple rooms have slightly different dimensions in this one because I updated some numbers after visiting the house and measuring). Now. My biggest and most ambitious plan?? The one about which I'm most excited - but also sadly is probably the least likely to happen because it'd probably be like $20K? See that laundry room? In an awkward place right by the front door and what you see when you come in from the garage? Wouldn't that make a fantastic mudroom???? It'd make such great sense flow-wise. With mudroom lockers/shelving like this along the wall where the washer and dryer currently sit? YES. You can see it right?? 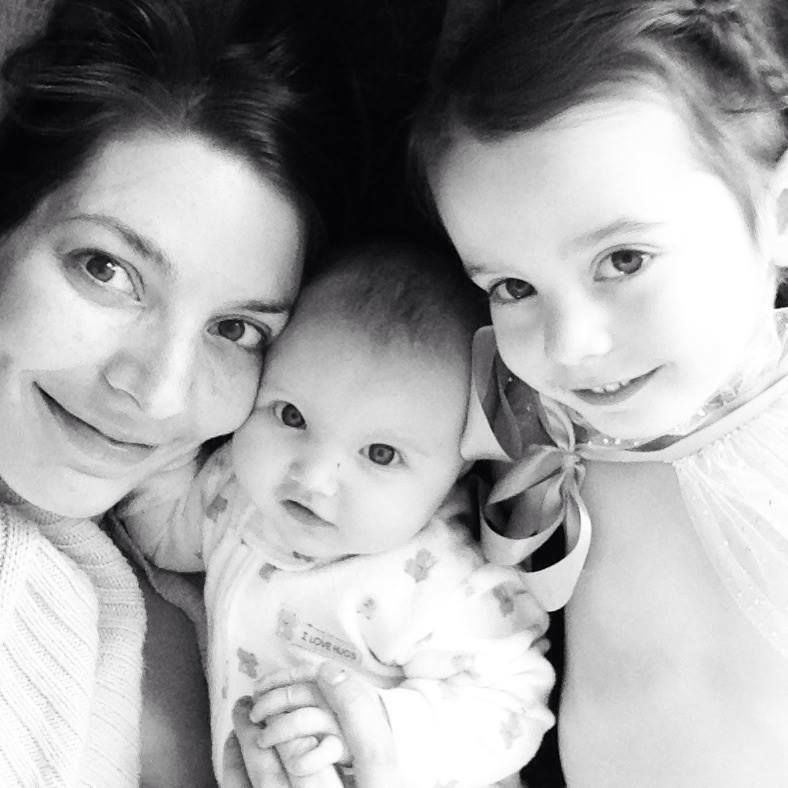 Ok, you probably can't, since you haven't been in the house, but I'm totally and completely in love with this idea. Where would the laundry go? SECOND FLOOR BABY. Speaking of the second floor - here it is. That's the master bedroom in the upper left, with the master bedroom closets (there are two walk-in closets - on off to the left and one at the very bottom of the image) and bathroom immediately below it. The tub and sinks are in the main area, and the shower and toilet are behind a door. That first L-shaped closet is actually one of those DIY projects the owners did - they built it into empty space between walls so it's very strangely shaped (the shape in the floorplan doesn't begin to touch the actual shape). 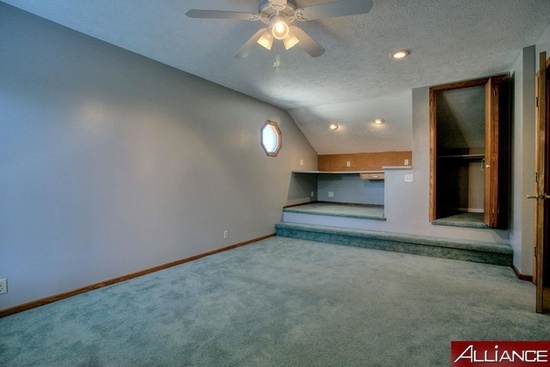 But into that oddly shaped room would go - according to my ultimate desire (name that Disney song!) - the new laundry area. Depending on the plumbing layout, I'd also be open to putting them in the smaller closet at the bottom. I've been looking at a lot of second floor laundry rooms and plans, so I have all the details on how to minimize the risk of flooding should it ever overflow (like build in on a shower base). But....it's probably too cost prohibitive to move the supply lines. Whomp whomp. I'm getting a quote, though. Because I feel like this is probably more important than the girls' college funds. (KIDDING pls don't hate mail me). Emmeline's room will be the bedroom in the top middle, then there's the shared bathroom, then the playroom at the end (somehow I accidentally turned the playroom closet carpet orange, but be assured it's just as green as the rest). Cary's room is at the bottom, and she has her own 3/4 bathroom. So. We're now in a waiting game to see if that last 25% comes together. In the meantime, I'm boxing up all our knick knacks and other things we won't need for the next six months (in case this falls apart and we start the process all over again with a new house). That means we, very surreally, have boxes piling up in our doorway and a pile of donation items piling up in the basement. And we're in the midst of important physics experiments, like, "How can boxes of items take up more room than the items themselves?" and "How can we be emptying the house but it feels more cluttered than ever?" It's also playing games with my emotions and I've reached the "OMG WHAT ARE WE DOING" stage. And the "WE BROUGHT OUT BABIES HOME TO THIS HOUSE HOW CAN WE LEAVE" stage. And the "BUT WE HAND PAINTED THESE BIRCH TREES AND WE CAN'T JUST LEAVE THEM" stage. Assure me it will all be okay and we'll have new beautiful memories in the new house. Please.